The family tree files below are now easier to download-much smaller! First recorded "Stotzer" was around 1395/1396 in the area of what is now Rottweil, Germany. 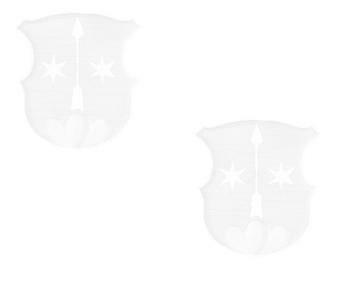 Here's the Crest alone and a Wallhanging version. * My group (shared with Helen Stotzer and family in Switzerland) who settled in the area of the city of Cleveland, Ohio. One branch of my Stotzer family tree connects to the Texas US Stotzers. Other branchs of my tree lead to Stotzer groups that emigrated to and settled in Mineral City, Ohio (Easton) Pennsylvania/New Jersey to a Nicole Stotzer and her family in Switzerland, and lastly the Stetchers (formerly Stotzers) of Illinois. 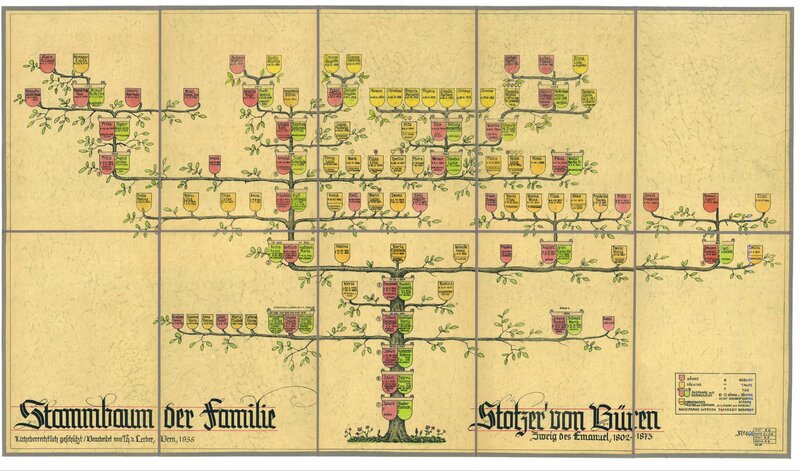 * The Archbold, Ohio group shares their Stotzer family tree with Willy Stotzer (Switzerland) and Ottawa, Ohio groups. Note: The Cleveland and Archbold groups are connected by a Stotzer-Stotzer marriage in the 1800s! Note: The Illinois/Wisconsin and Pennsylvania/New Jersey groups are connected by a marriage in 2001! * A small group in upstate New York. We are still searching for the final connections between all the above Stotzer groups-See the Missing Links page! 2011: Discovered that my father, Harold Stotzer, had a third brother Ernst or Earnest that passed away at age six months in 1909. 2010: Discovered that my grandfather, Gottlieb Stotzer, had a cause of death of: "strangulation, suicide" and had been arrested a few weeks before his death for chasing the family doctor around with a gun! To download: Right click on the link. Choose "Save File as.." or "Save Link as.."
Save it on your hard drive. Connects to tree 5 via this marriage: Alexander Stotzer b. 1843 (tree 2) married Maria Luise Stotzer b.1846 (tree 5). Connects to tree 8 via this ancestor: Jakob Stotzer b.1769 d.1841. plus the "Stetchers" of Chicago. Same as above note. Also connects to the Illinois/Wisconsin (I/W) group via this marriage: John Stotzer (I/W) with Edith Owen (tree 2) from the PA/NJ group. Same as above note. Also connects to tree number 6 below via this marriage: Ernst Rudolph Stotzer b.1887 (tree 3) married Anna Stotzer b.1886 (tree 6). 4/"Zweig des Joh. Jakob, 1759-1821"
No connection to others trees yet. Connects to tree number 3 above via this marriage: Ernst Rudolph Stotzer b.1887 (tree 3) married Anna Stotzer b.1886 (tree 6). The data on this tree is a subset of what is contained in tree 2 above. Connects to trees 1-3 via this ancestor: Jakob Stotzer b.1769 d.1841. US Illinois/Wisconsin (I/W) Group plus the Iowa "Stotsers"
There is no von Lerber Stotzer family tree or data for this the US Illinois/Wisconsin Group. This group, however, connects to tree 2 (PA/NJ) via this marriage: John Stotzer (I/W) with Edith Owen from the PA/NJ group. The earliest STOTZER on record found so far is: "Hans der Stotzer" born 1395 or 1396 in Rottweil, Germany. 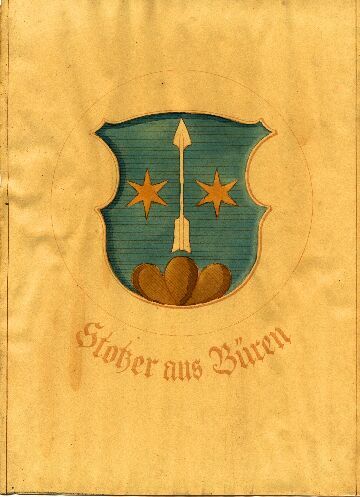 The STOTZER surname can be found back into the 1500s in both Germany and Switzerland. For now we assume we share a common family heritage that probably began in what is now Germany. 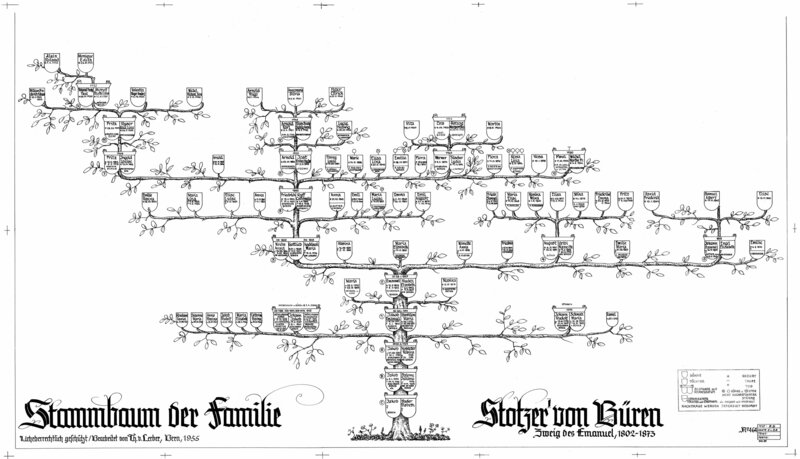 The STOTZER surname may be descended from earlier (12th-14th Century) German surnames like STUCSE, STUZER and STÜTZER (STUETZER)-Please visit the German website of Dr. Andreas Stützer for more details. Today, STOTZER seems to be the common Swiss/US spelling of the name while STÖTZER is the the most common German spelling. Those that can't type an umlaut (the two dots over the "O") spell STÖTZER as STOETZER in typewritten correspondence. One branch of the STOTZERs in the US that settled in Iowa changed their last name to STOTSER while another group in connected to the Cleveland group changed the name to STETCHER for unknown reasons back in Chicago in the mid-1800s. Stotzer Research Goals: See the Research Notes page. Discover the family links between the all the US/Swiss Stotzer groups shown on these pages. Status: In work-see the Missing Links page. Trace the origin of the Stotzer surname in Europe. Status: In Work-need help over in Switzerland to search old records. See the Unresolved Issues page. Via EMail (If you change your email address please let me know! ): Csaba Stotzer from Hungary (traces his ancestors back to Germany in the 1800s); Sylviane Stotzer (French only) from Geneva, Switzerland; Willy Stotzer, Martin Stotzer, and Dorothea Stotzer from Bern, Switzerland; Susan Stotzer Null from Texas; Bruce Stotser from Iowa; Sandy and Beatriz Olvera Stotzer from Los Angeles, California; Andreas Stötzer from Benshausen, Germany; Peter Stotzer from Australia; Marc-André Stotzer from Clarens, Switzerland; Robin Roberts from Holly Hills, Florida; Franz Stotzer and Christoph Stotzer from Büren an der Aare, Switzerland; Helen Stotzer from La Chau-x-de-Fonds, Switzerland; Nicole Stotzer from Solothurn, Switzerland, Gaston Edgardo Alegre Stotzer from Argentina, Magnus Zetterberg from Sweden, Jerilyn Lewis Ormsby (Stotser ancestor) from Spooner, Wisconsin, Charlotte Soderblad frm Sweden. A note to all those who submitted their entire Stotzer family tree data: I have not entered all the family members down to the latest child or grandchild into the family trees on these pages. Once I make the main Stotzer group connections, I will enter the remainng family members. I hope to someday enter all the names/dates into a family tree program to later distribute to all those interested in keeping the data on their computer and updating it later for their Stotzer family. Willy, the other Stotzers from Switzerland and Monica Laubscher, Brigitte Fellmann from the City of Büren an der Aare archives office for all their help and support in acquiring the above noted Stotzer family trees and supporting data in 2003. Mr. Gustav Wehrli and Mr. Theodor von Lerber, both professional Swiss genealogists (sadly both are now deceased) for their extensive Stotzer family research work in the past. For Swiss/Stotzer family histories back to the mid-1700s, contact the "civil records office" in Büren an der Aare (In German or English). Ask for a "Familienschein" of the person you are looking for. 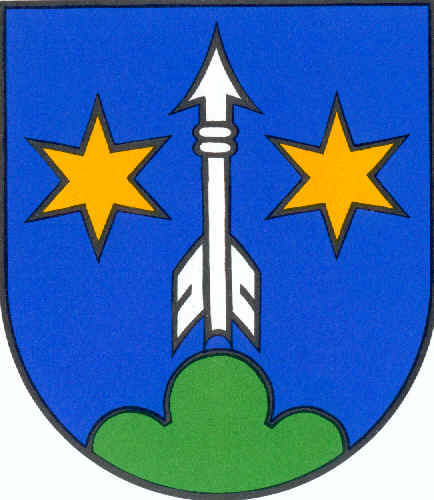 The city's website is: http://www.bueren.ch. 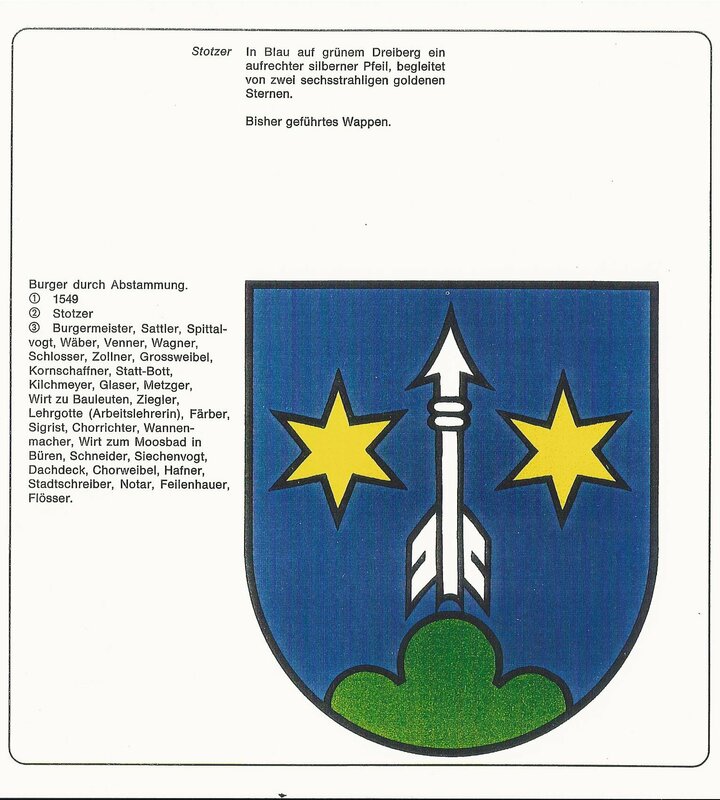 For Swiss/Stotzer family histories before the mid-1700s you have to contact the State Archives of Canton Bern in Bern (the capitol of Switzerland) look for links to "Staatsarchiv" then "Familienwappen." Family Tree Software-is used to enter family trees and detailed information into your computer or read Gedcom (*.GED) or Family Tree (*.FTM) files on your computer. 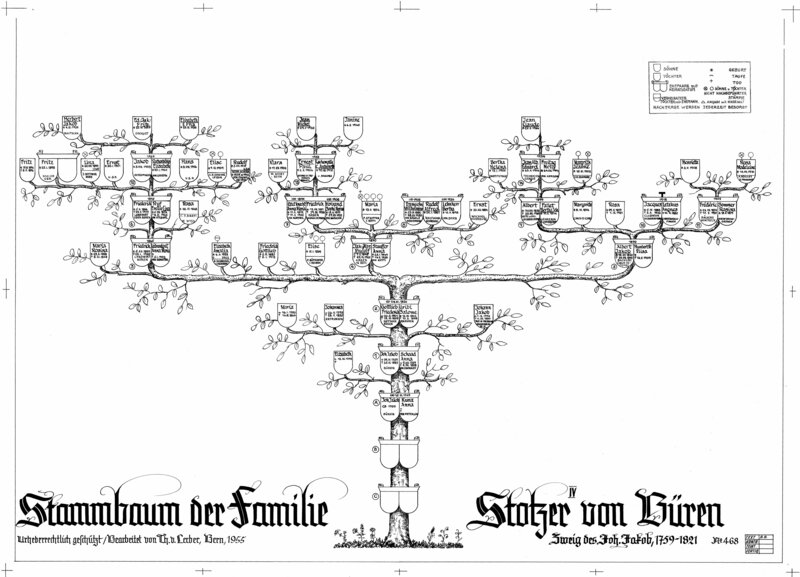 Family Tree Maker (FTM) latest version is "FTM2005." May be the best selling family tree program for Windows. This page maintained and uploaded from Pacific Grove, California-USA. All pages at this site-Copyright 1997-2013 by Mark D. Stotzer. Listen to some "Smooth Jazz" online!